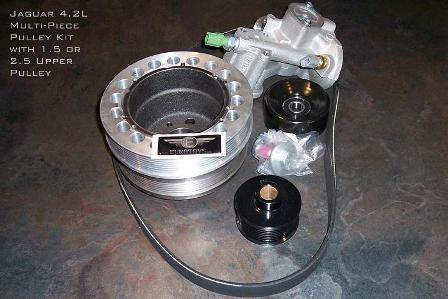 Brand new never opened or installed complete kit with Modified Lower Crank Pulley/Dampener, Modified Oil Filter Adapter, Crank Pulley retaining bolt, Idler Pulley and Special Supercharger Drive Belt. Paid $1358, make me a fair offer. I never had time to open it and install it and now on to other projects. I believe there are core refunds available for the OEM filter mount and OEM pulley when returned to Eurotoys. Fits all 4.2 litre forced induction motors including the XKR, S-type, XJR, etc. Same thing , my messeges don't go through . It tells me your storage is exceeded. Sorry I am not sure why. I get private messages everyday and I did get one from you that said test.